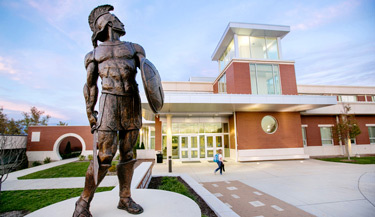 Set up a Job Alert to be notified when Missouri Baptist University posts new jobs. At MBU, students grow through a rewarding, versatile experience that extends far past the classroom. Student Life molds leaders through a holistic approach that includes everything from student government to cultural getaways to Chicago. It starts the moment you start at this University with the integration of the First Year Experience and doesn’t end until you walk across the commencement stage. Our goal is simple: to equip you with the tools to become a lifelong leader and have an unforgettable time in the process. It’s about Shining On. Through its curricula and classroom experiences, the university seeks to develop and nurture diversity because it strengthens the organization, promotes creative problem solving, and enriches us all. The goal is to present materials and activities that are respectful of diverse groups including, but not limited to, race, gender, color, national or ethnic origin, age, qualified disability, military service, learning differences, or socioeconomic status. MBU Timeline is MBU’s student-run, campus news website that incorporates multimedia reporting for the university community. Timeline Online features episodes of Timeline, MBU’s weekly student news broadcast, and is always looking for reporters, photographers and bloggers to add to their diverse team. Missouri Baptist University is an evangelical Christian, liberal arts institution and has as its purpose the offering of programs of study leading to professional certificates, undergraduate degrees, and graduate degrees in an environment where academic excellence is emphasized and a Biblically based Christian perspective is maintained. The University is committed to enriching its students’ lives spiritually, intellectually, and professionally, and to preparing students to serve in a global and culturally diverse society. 1. To develop a personal philosophy of life and an ethical and spiritual commitment which is based upon an awareness of alternatives and which is examined in the light of Biblical revelation. 2. To grow in an understanding of themselves, as well as others, and to cultivate an ability to employ this knowledge for self-development, for mental and physical health, and for social and family relationships. 3. To prepare for living in harmony with the physical environment by becoming aware of its basic principles, and of the means for intelligent use and conservation of its resources. 4. To develop effectiveness in the use and understanding of communications, both spoken and written, employing analytical and logical thinking in the process. 5. To become contributors to society in a manner consistent with Christian principles, participating responsibly in church, school, community, and world affairs, employing insights derived from a broad range of studies. 6. To grow in understanding, appreciation, and enjoyment of literature and the arts, and to become participants in creative and aesthetic activities in the community. 7. To prepare for continuing study by becoming acquainted with electronic technology resources and methods of scholarly research. · To teach, empower, and inspire students for service and lifelong learning. · We are serious and intentional about our Christian faith. · We will freely and responsibly search for truth. · We strive for excellence. · We believe in the importance and cultivation of character. · We believe in social change through service and leadership.